5 Axis Dardi Machine - traverses a 6'x10' cutting table. The five axis configuration enables it to cut bevels, tapers and lofted or swept surfaces. It is capable of cutting materials up to five inches in thickness. 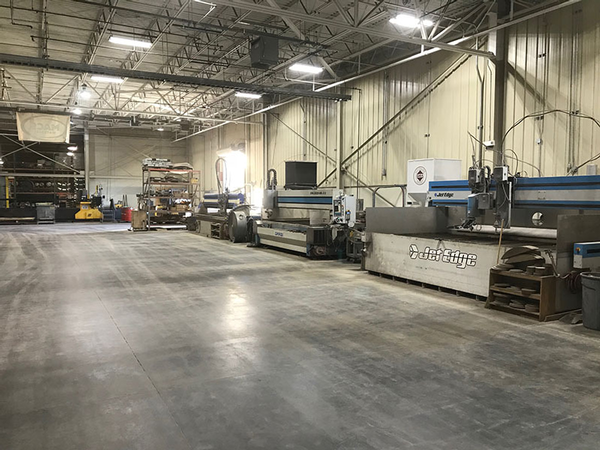 3 Axis Ward Machine - is an 8'x12' cuttong envelope and can cut up to 11 inches thick! It rests on a 8'x13' table and can make a single part up to 8'x12' or 8' in diameter. The ward machine can cut almost any 2 dimensional shapre. With two cutting heads, it can produce duplicate parts simultaneously, cutting lead times in half! 5 Axis Jet Edge Machine - is a 5 axis dual head machine combining the agility of our Dardi table with the production velocity of our Ward machine. It cuts precise taper-free parts from virtually any material and is capable of cutitng sophisticated 3 dimensional parts such as impellers and bevels up to 45 degrees.